Years ago, it was a challenging task to deal with the dead batteries. Vehicle owners needed to call professionals for assistance at the roadside. But with the advanced technologies, all such car battery related issues can be handled with ease. Well! All this happened due to the development of battery jump starter products that have the efficiency to bring a dead battery into working condition. Now drivers can make their car ready for the ride within a few minutes even without taking help from anyone else. Although the market is loaded with a variety of battery jump starter products; but here we are going to talk about NOCO GB70 Car Battery Jump Starter unit that has gained huge popularity due to its impressive performance. This product is capable enough to bring your car battery to normal condition even when it is placed under cold weather conditions in the peak winter season. In the GB70 review below we help you to find detailed information about this product. You will be happy to know that NOCO GB70 is made up of strong lithium-ion jump starter. It is capable enough to deliver 15700 joules and 2000 amps to start any dead battery and that too within a few seconds. Experts reveal that this portable jump starter unit is designed by using spark-proof technology. At the same time, it is designed with a polarity protection circuit and ensure harmless operation to inexperienced people as well. GB70 jump starter review says that its awesome performance makes it stand ahead of many competitive units in the market. Most of the people report that they don’t like jump starters with heavy size and bulky design because they are difficult to move from one place to another. Such large size jump starters also become difficult to store and carry as well. But there is nothing to worry about with NOCO GB70 car battery jump starter. This latest unit is designed using advanced technologies. Moreover, Noco Genius Booster Company designed this jump starter unit to ensure higher portability and easy movability. Vehicle owners will be surprised to know that the latest jump starter units can be easily stored in the side wall pocket, glove box and trunk of the car as well. Due to its simple design and higher efficiency, this jump starter is commonly used in large government organizations, police departments, in armed forces and in industries as well. The great news for users is that unlike other products, NOCO GB70 car battery jump starter works well with almost all types of brands and a wide range of vehicles. This powerful and well-designed unit can be used to jump-start heavy trucks, cars, and boats that are driven by diesel or gas. The NOCO jumper is the perfect choice for 8 liters gas engine as well as for 6 liters diesel engine. Its services are not only limited to jump-starting your vehicles; rather at the same time, it can also help to charge your tire pump, phones and many other electronic equipments that work on 12V supply. When fully charged, NOCO GB70 car battery jump starter is designed to deliver jump start within the range of 20 to 40 jump starts. However, even after having higher charging capacity, this device cannot harm your engine even if you end up making wrong connections. It can also keep you safe if you accidentally touch the clamps. Manufacturers say that the lithium-ion battery contained by this jump starter unit can hold charge almost for one year. So, you can ensure a long-life service with this product. This jump starter has been used by numbers of people till now, and they are happy with its performance. Along with the high-performance operation, it has the ability to withstand heavy usage and rough handling as well. Indeed, NOCO GB70 car battery jump starter will never disappoint you with its performance. Most of the buyers around the world are highly satisfied with the budget-friendly market price of NOCO GB70 car battery jump starter. It is rated high because of its compact, handy, easy to move and lightweight design. You can easily travel with it as it doesn’t consume much space in your car. Once it is fully charged, it can easily serve 20 to 40 jump-start sessions. You can rely on this product for its high-quality performance. 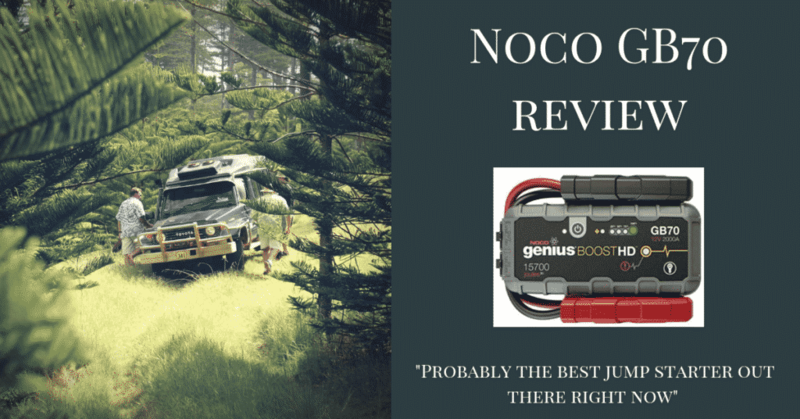 GB70 booster review says that NOCO GB70 car battery jump starter is loaded with a wide range of safety features including reverse polarity design and spark proof technology. It is not just a basic jump starter unit; rather it is much more than that. Irrespective of its small size, it can ensure consistent performance for all your jump start sessions. Moreover, it can also charge your electronics during long hour journeys. This product has been used by numbers of people till now, and they are happy with its quality of connections, cables, wires and the ability to charge your phone 2-3 times before demanding recharge. Another essential benefit of this product is its additional light. Note that most other competitive units are designed with a basic LED, but NOCO GB70 car battery jump starter is capable enough to serve as a flashlight with its high-power system. The light system of this jump starter unit is loaded with a 400-lumen bulb. Its bright light is clearly visible to motorists. Moreover, it has 7 different modes of operation, and you can also operate it as an SOS strobe light for attracting help at the time of emergency. It takes a longer time to get fully charged. NOCO GB70 car battery jump starter is not able to handle bigger machinery so well. No one like to face the hassle and frustration associated with the mid-journey vehicle battery issues. If you want to make all safety arrangements in advance, prefer to place an order for NOCO GB70 car battery jump starter. This portable unit can ensure long-term performance without even demanding any additional repair or maintenance. Prefer to place an order for this latest jump starter unit to ensure fast delivery at your doorstep.